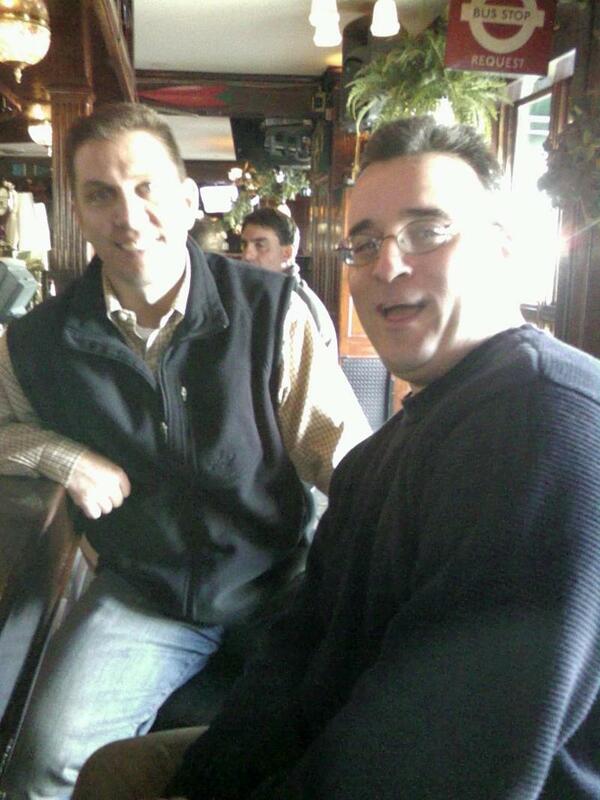 I spent a few hours in Downtown Wayne, PA catching up with Cabrini buds Matt Hodlofski and Lou Monaco. In between ripping the Mets and discussing our hatred of both Superbowl teams, I enjoyed a few beers and some grub at The Great American Pub. The food wasnt bad and the company was excellent. I had a Blue Moon and a Seafood Gumbo to start. The gumbo had great flavors, small Gulf Shrimp and nicely done sausage bites. Matty H recommended it and I appreciate the good work. After an hour or so, a few Yuenglings and a $10 parking ticket, I had a Spinach, Crab and Artichoke dip that had no discernible crab and TONS of gooey excellent melted cheese. 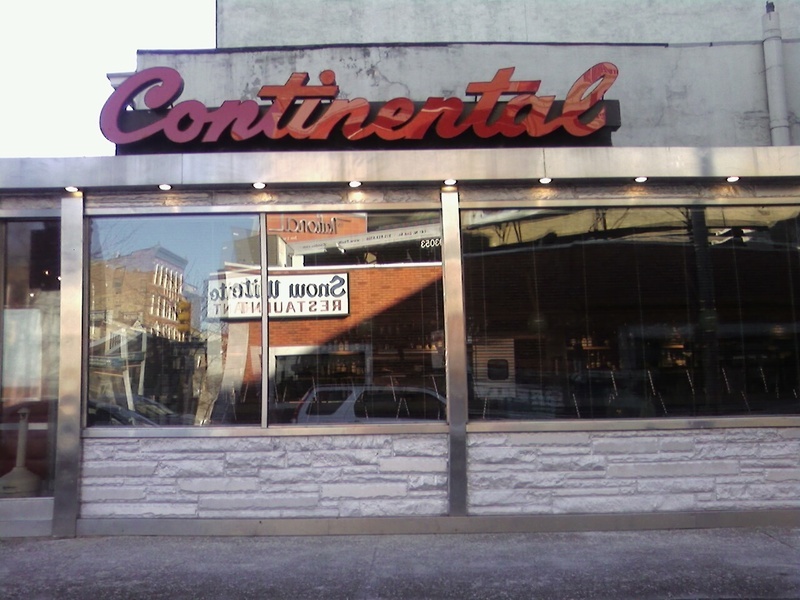 The food was pretty good for afternoon bar fare. The staff was pleasant and kept the food and drinks coming. The space has been improved greatly in the 14 years since the Wayne Tavern and DQ closed. The door and the bathrooms are still in the same place, but everything else has changed. The beer selection and bathrooms aren't as amazing as Teresa's Next Door Bar up the street, but the food and room are better on balance. Have you ever had one of those weeks where you look back and wonder what the hell you did all week? There's so much to do at work right now, I need to make a list of all the things "on my plate" just so I don't forget one. One semester is starting, we're trying to get ready for the Fall 2008 students, a guy is leaving and I have three major reports and projects I am 'tasked" with. That plus all the meetings, regular staff stuff and student issues. I am left feeling overwhelmed. Of course there are the home front things too. Mom had a stress test yesterday. It went great, but meant a dash out to Media at lunch time before stopping in to check on my dad than heading back to the office for 2 more meetings. The kids are awesome and a great source of energy but driving them all over Burlington County is PITA but one I have to bear I guess. I fall into bed each night totally exhausted and sleep like a log until the last possible second. I need to find some time to work on my personal projects, writing, photography and reading, but I barely seem to have the time to read a few pages a day. Don't get me wrong. I'm not just bitching and moaning. I'm happier today that I have been in years, I just want to know how to get it all done. 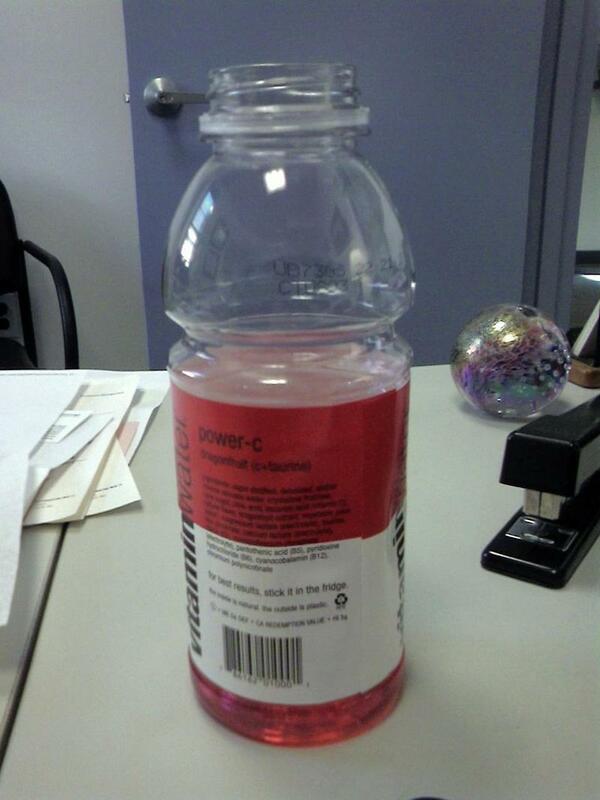 I could drink Vitamin Water all day. All the flavors are great, but I think I could exist purely on Power-C (pictured) and Energy. Wonder what they put in this stuff that keeps you needing a fix of it? John is very excited to be at Family Science Night tonight. 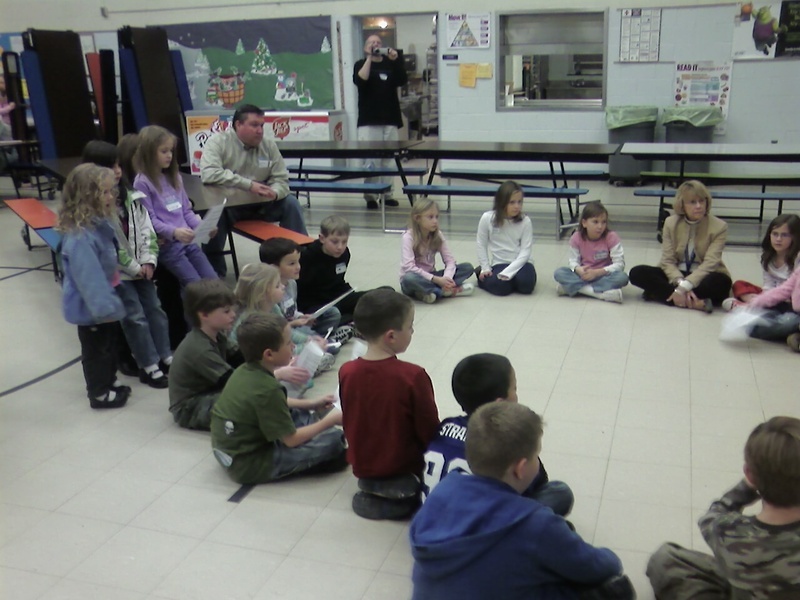 About 50 of us, evenly split between parents and kids who are learning about animals tonight. It's a lot of fun watching the kids interact and also good fun catching up with some of the parents. John will be tired when we get home, but it is worth it! As I sit here on the way into work (late again), I look to my left and have to smile. Stephen Starr's formerly-trendy Continental Old City is closed up tight this Wednesday morning, recovering for another nightly onslaught of partiers who will cross over from South Jersey tonight. For now it's dark and quiet, but in 12 hours a barful of 20- somethings will be hoisting $12 speciality cocktails and sharing little plates of wasabi mashed potatoes. 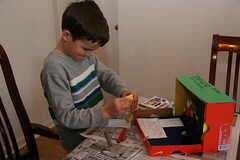 John spent a good bit of the morning finishing up his diorama project for Mrs. Lacey's class. He came up with all the ideas himself and was able to do the whole thing with only a tiny bit of adult assistance. He chose to read Arthur's Computer Disaster and then did his project on the book, showing a scene from the book. He converted a Nike shoebox into Arthur's house, complete with Arthur's sister DW and his friend Buster, all made out of clay. He added a royal blue felt carpet and some snazzy construction paper walls to make it all very homey. Some LEGO furniture rounded out the scene. Along the way I had to drive him to the store to get the clay, glue and construction paper. Then I presented a lesson on the safe use of scissors. After a few mis-steps on measuring and cutting a remedial lesson on rulers was in order. He only needed a bit of demonstration on the clay modeling, which surprised me. I am sure there will be a wide array of project levels presents at school tomorrow from the totally parent-created to the woefully under-supervised. John's will be on the honest end of the scale, but fairly well-executed. Now he just needs to get it to school in one piece! We're in a looking back mode here today. So today's Fantastic Four is in the 'back in day' mode. What four things were cooler/better when you were a kid? 1. Winter - remember blizzards? Real ones, not Bolaris-overhyped ones that turn out to be flurries. 2. Theme Restaurants - Farrell's Bellybuster was friggin AWESOME! 3. Movies - The real Star Wars, Indiana Jones. This Harry Potter stuff is crap. 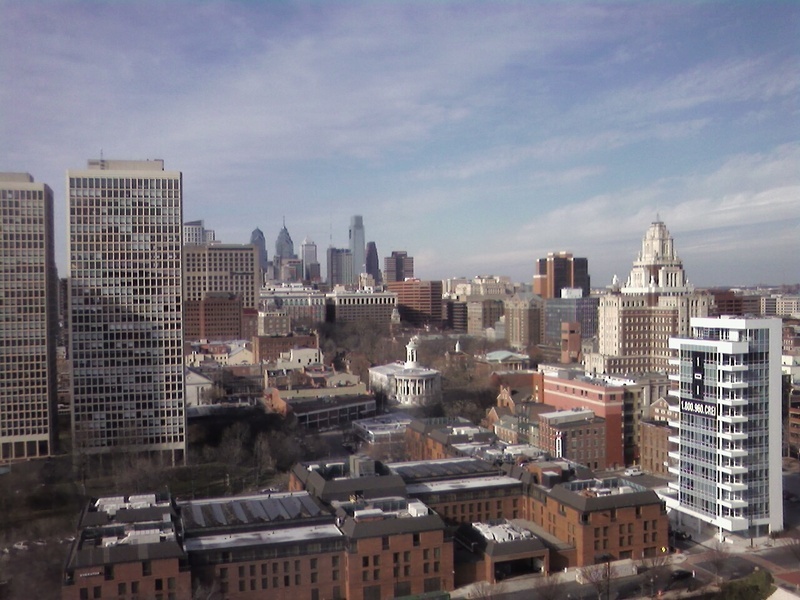 Morning over the Philadelphia skyline is pretty darn pretty! I am getting myself together after last night's big party downstairs at Hair o' The Dog. We had a good time with MRGG, Bobby and Johnna and Byrnzee and Michelle. I'm feeling pretty good, no ill effects and I now tun my thoughts to a nice brunch. Oh. One other note. Some things are just better in a hotel! Many thanks go out at this moment to Dale Jasper of the Enduo Burlington Tailor Shop at The Burlington Coat Factory in Marlton, NJ! He just altered my tuxedo pants in about 10 minutes, ensuring a comfortable Hair o' The Dog for Another Delco Guy tonight. We're on our way to the event right now, and I am blessedly relieved that I won't be partying for seven hours in pants that mysteriously shrunk over the holidays. I only had to wait a few minutes while he finished up a suit for a guy headed to a wedding. His had shrunk somehow as well. So if you need quick tailoring, or any tailoring for that matter, drop in and see Dale at the Burlington Coat Factory on Route 73 South in Marlton. I had another Fantastic Four ready for today, but given today's frigid temperatures, it can wait. 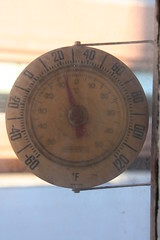 Based on the aged thermometer outside my filthy Center City office, it's 21 degrees at 8:45. That's snot-freezin' cold! What four places on earth would you rather be today than where you are? 4. Quebec City - If I am going to be freezing to death, I would rather do it in this beautiful city. Have a great (and cozy) weekend! My Grandpop died 12 years ago this month. I've written about him in the past and still look up to him as someone who always helped me when he could and was as encouraging to me as anyone has ever been. To say that I miss him, even all these years later does not begin to cover the feeling. I recently realized that among the things I 'lost' in my divorce was the flag that my father gave me from my grand father's coffin. I'd like to have it back, but it seems unlikely at this point. I feel pretty guilty that it's gone now and have been upset that I let him and my family down by losing control of such an important touchstone to the past. Last night I had a very vivid dream that Grandpop was still alive and I went to talk to him in his bedroom. That would have been very unusual, since I only went in his bedroom a few times over the years before he got very sick near the end. The dream was quite vivid and had a very lifelike quality to it. It was very early morning in the dream, dawn just touching the sky. There were Christmas presents in the house and his Norway spruce was decorated. Take it for what it's worth, but I think I will 'let him sleep' for a while. In the past I have spent too much time looking back and not enough looking forward. I still don't look forward much, but I have stopped re-living the mistakes of my past. I saw this little exercise on the internet - thanks didyouevernotice - and decided that it was actually worthwhile to take a half hour or so to look back on the year. So please tolerate the self-indulgence for today. You won't learn that much you didn't know, but you may smile once or twice. 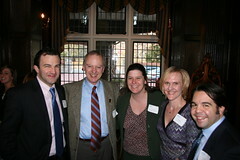 The idea comes from Mary Schmich the Chicago Tribune columnist, who first popularized it in 2005. She's also responsible for the 'Wear Suncreen' phenomenon. In 2007, I gained seventeen pounds. I lost my temper too often. I stopped by Wawa too much. I started giving away things. I was hugely satisfied by my progress as a photographer. And frustrated by my lack of progress as a writer. I am so embarrassed that I am so out of shape. Once again, I resolve to get back in shape. Once again, I did not learn to swim. The biggest physical difference between me last December and this December is my longer hair. December is feeling much more at peace with where I am in life. with the kids and GF and family. Why did I spend even two minutes watching network TV? I should have spent more time writing. I regret buying pants that are now too small. I will never regret buying my morning coffee even though with that money I could have bought a vacation. The ex drove me crazy. Was work crazier than ever last year? Or was it me? I feel so far away when I write that down. Why did I go to Seven Springs?????? The best thing I did for someone else was kiss a boo-boo. The best thing I did for myself was relax. The best thing someone did for me was not something I am writing on the internet. The one thing I’d like to do again, but do it better, is cook regularly. Happy 2008 to you all! I am recovering from last night's festivities and looking forward to a day of NOT watching football. I've always been a big fan of the bowls. I used to watch them all, from the San Diego County Poinsettia Bowl to the Granddaddy of Them All. This year I have not watched a single one. Not PSU vs A&M, not Florida Atlantic vs. Whoever. And I won't watch any of the bowls that actually matter. No BCS for me. Who? Because it's time for a real national championship for college football and I won't support the bloated, silly bowl schedule again until we get a system that give me a real national champion. Yeah, I know I am just one guy, but I am throwing down the gauntlet. I'm fed up and I won't put up with it anymore. I'm going to watch drunk union guys dressed as women. Have a great year and enjoy!